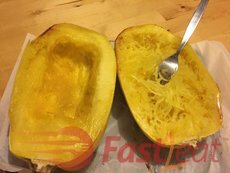 To make it easier to cut into the spaghetti squash, you place it in the microwave for 3 minutes or so. Some people just microwave the squash to cook it entirely, but I believe that roasting it in the oven is the best way to cook it. To open up the squash you carefully cut it in half lengthwise** using a large, sharp knife. The seeds should be scooped out of the squash with a spoon, similar to a pumpkin. Also similar to a pumpkin, the seeds can be preserved and roasted if you like. Brush the inside of both halves of the squash with olive oil. Season with salt and pepper. You can also season with paprika, garlic powder, onion powder, dried herbs — whatever the heart wants. 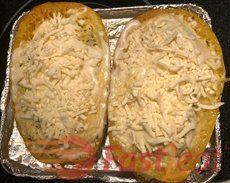 Place the two halves cut side down on a baking sheet (or tray or casserole dish that is large enough to allow them to rest flat) lined with parchment paper or foil. Roast the squash until tender, about 30* minutes. You might want to wait until the squash has cooled down enough to handle. Once the squash is soft and can be poked with a fork, you can shred the insides to get the spaghetti-like strands that the squash is named for. Spaghetti squash does not actually taste like wheat spaghetti. It will be sweeter, with a crunchier texture. Then just put your favourite sauce, a little cheese, and taste. * Large squashes will take around 40-50 minutes to roast, but small-medium squashes will roast in less time. Check after around 30 minutes or so to make sure you don't overcook them, as this will detrimentally affect its flavor and texture, they will become really mushy in the middle and won't form many natural spaghetti-like strands. To roast a whole, uncut squash, make several small cuts in the rind and cook at 350°F (180°C) for 60 to 90 minutes. Or you can also microwave your squash (but I believe that roasting it in the oven is the best way to cook it). 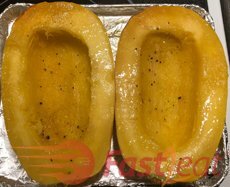 Tightly cover a dish containing a half squash, cut side down and a small amount of water with plastic wrap. Microwave on high for 12 minutes and check to see if the flesh is tender. **Another option instead of cut it in half lengthwise to form two “boats”, while that method works just fine, they say it disregards the way the strands grow inside the squash—in circles around the width of the squash. When you cut the squash lengthwise, you cut each strand in half, which makes for shorter, and often soggy, “spaghetti.” Try this instead (if you are not using the "boats" to serve): Cut the squash into rings to preserve the length of the strands. Preheat oven to 375°F. Trim off squash ends. Cut remaining squash into 1 1/2-inch rings; scoop out and discard seeds and membranes. Arrange rings on a foil-lined (or parchment paper) baking sheet coated with cooking spray. Coat rings with cooking spray. Bake at 375°F for 45 minutes or until just tender. Cool slightly. Cut through each ring and open slightly to reach strands; carefully scrape out spaghetti-like squash strands. 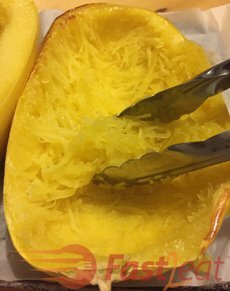 Spaghetti squash: what is it? It's just a squash, but this variety will surprise you. 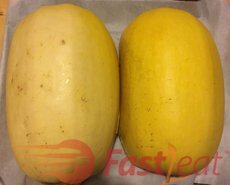 It looks like a lengthy melon, but when cooked, the meat of the fruit falls away from the flesh in ribbons or strands that look like spaghetti noodles, but in fact, it is just a variety of squash. 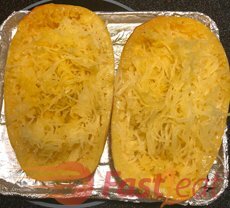 Low calorie and very easy to prepare, the spaghetti squash (also known as "vegetable spaghetti") is already a mandatory presence in the low carb diets. According to the tips I’ve researched, when buying spaghetti squash, you should choose a firm, dry, rind free of soft spots and cracks. Avoid Spaghetti squash without stems. The stem itself should be short and round, without excessive damage, which helps keep out bacteria. Pass on shiny or green spaghetti squash. This could indicate that the squash was picked before it was ready (ripe). Shininess may also indicate that a wax coating has been applied to the squash. If possible, select a squash that has not been coated in wax. Store squash for up to three months. If you get a freshly harvested squash, it can last several months in a cool, dry location. Keep the squash out of direct sunlight or heat. Do not refrigerate uncooked, uncut squash. Putting your spaghetti squash in the fridge will actually make it spoil more quickly. At refrigerated temps, your squash will only last a week or two. If you cut your squash and use only some of it, wrap the unused portion tightly in plastic wrap and refrigerate it. Use the rest of the squash within a week or so.